Former Ford Canada CEO Dianne Craig looks for similar success in U.S.
For Ford's Dianne Craig, the pleateauing sales market poses a new challenge. 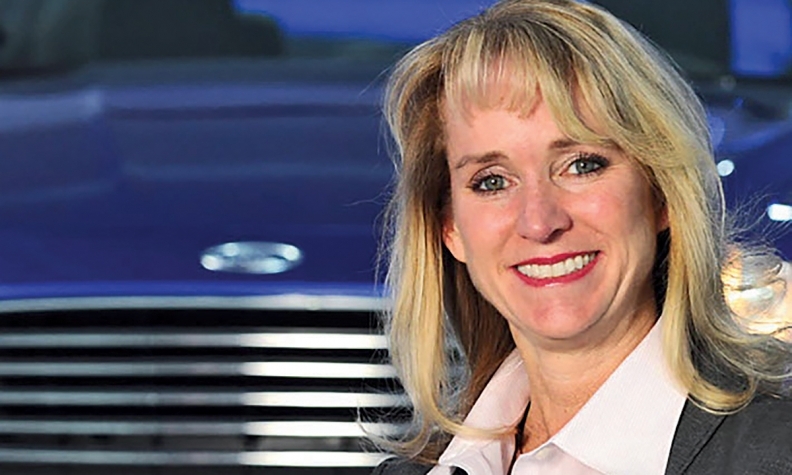 DETROIT -- Dianne Craig, Ford's director of U.S. sales since Jan. 1, has entered her new job facing rising incentives and falling new-vehicle demand. Managing a plateauing market will differ from the challenge she faced as head of Ford's Canada division, where she presided over the peak of the sales cycle. Craig, 53, was in Canada from November 2011 through 2016. Under her watch, Ford continued its run as the top-selling brand there, a title it has held for the past eight years. The automaker notched record dealer profitability and record customer satisfaction scores by internal metrics, she said, although Ford declined to provide specifics. To repeat that success in the United States, Craig said she'll implement many leadership practices that marked her tenure in Canada, the most vital of which is getting out and meeting dealers face to face. "I truly believe the answers are in the marketplace," she told Automotive News. "We don't have all the answers here in Dearborn." Since her promotion took effect roughly 80 days ago, Craig has met with dealers at events in New Orleans and Georgia and has visited a handful of sites across the country. Natalie Tindol, dealer principal at Tindol Ford in Gastonia, N.C., has met with Craig several times, and said she's excited to have her expertise in the United States. "She has a great reputation with dealers," Tindol said. "She cares and seems to have the best interest of all top of mind. We are partners and she understands that." Craig said the biggest result of the initial meetings is that Ford plans to change how it develops its incentives program, moving toward a regional, rather than national, approach. That could mean tailoring incentives regionally based on competition or other factors, a practice it has tried in the past. That contrasts with more recent Ford efforts such as its Volume Growth Bonus, a stair-step program that ran from March 2015 through early 2016 and awarded per-vehicle bonuses that increased as dealers hit individual volume thresholds. While per-vehicle customer incentives are rising, Craig noted that in February, Ford's increased about $90 (all figures U.S.) from a year earlier to $4,570 while the industry's rose $380 to $3,830. "We're very, very disciplined with our incentive approach, but we have to balance that with keeping our dealers competitive," she said. Craig said she's optimistic about Ford's sales in 2017, and said the U.S. industry could do even better than Ford's forecast of 17.7 million new-vehicle sales, including medium- and heavy-duty trucks, because many of the macroeconomic factors that drove record light-vehicle sales for the past two years are still in place. Ford Motor's 2016 U.S. light-vehicle sales fell 0.1 per cent from the previous year to 2,599,211. Through February, the automaker's sales are down 2.5 per cent from a year earlier to 378,650. Much of Craig's optimism is rooted in Ford's product portfolio. "Our lineup's the best it's ever been in my 30 years with the company," she said. Dealers such as Tindol, however, are concerned about the automaker's car lineup. Ford's car sales were the sore spot in 2016, dropping 13 per cent for the year, while SUV/crossover sales rose 4.9 per cent and pickup sales jumped 6.1 percent. One of the dealers' biggest concerns, Tindol said, is how Craig will help them manage the car market. Craig noted that Ford will try to increase its car market share. While some of those sales will be driven by incentives -- Fiesta subcompact sales rose 6 percent in February, thanks to generous deals -- the challenge will be to avoid relying too heavily on them. "Any tenth of share in any segment is a battleground," she said. "But it comes down to the balance and being smart." Craig joined Ford in 1986 and has held several marketing and sales positions. Before becoming Ford of Canada CEO, Craig was general manager of the U.S. Southeast market area and was head of U.S. dealer relations for Ford, Lincoln and Mercury. "So much of my time has been in our field locations across the U.S.," she said. "So much of what I've learned in this industry I've learned from dealers." Craig has been married for more than 20 years and has a teenage daughter. She said she enjoys family skiing trips, puts hot sauce on almost everything she eats and is a huge John Denver fan. Craig has made a strong impression. Before Craig moved to Canada, O.C. Welch, the president of O.C. Welch Ford-Lincoln in Hardeeville, S.C., told Automotive News that Craig was "the best thing that has happened to Ford's Southeast market since 1958." He called her a team-builder, peacemaker and friend. Craig said she hopes her time as head of U.S. sales will be marked by accountability on the factory and dealer side. She said she'll continue to travel and meet with dealers to earn their trust and respect. "They inspire me every day I speak to them," she said. "They're eternal optimists about our future."